Need more information about booking Home 388735 ? 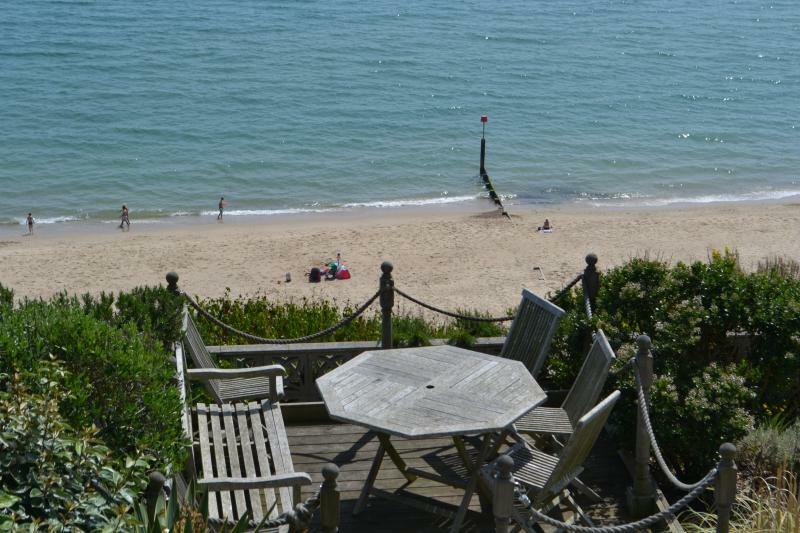 Beach View (one of "12 great houses by the sea" The Times April 16th 2016) is a beautifully presented spacious, light and airy detached house occupying a stunning position directly on the sea front and is just two hours drive from London. It has breathtaking panoramic sea (and beach!) views from Hengistbury Head across to Poole Bay. For pictures search "You tube Beachview Southbourne". The gentle washing of the sea can be heard from the house. Luxuriously appointed and fully equipped with superking size pocket sprung zip and link beds which can be made as singles on request.Beach View appeared in the Guardian Travel section as the first entry in the English section of " The top 100 Beach Holidays Worldwide". .A short walk takes you to the coastal zig zag path down to the glorious seven miles of golden beaches (voted Best Beach in the UK). A superb 34' long conservatory leads out to a garden with decked area. It includes free access for four guests (at any one time) to a luxury child friendly hotel heated indoor and outdoor pool including jacuzzi, sauna and gym facilities. A five minute walk takes you to the local pub/restaurant. A cycle ride along the beach takes you to the Hengistbury Head Nature Reserve/ Mudeford. A 5 minute drive east takes you to the historic town of Christchurch which leads to the New Forest. A 10 minute drive west takes you to Bournemouth with its excellent shops and theater. Sandbanks and the Jurassic Coast are an easy drive away. Southbourne is reputed to have a micro-climate making it one of the sunniest spots in England but with many things to do if it rains. You only live once! Find full pictures and details by googling "beachviewdorset" and see "fantasticbeachview" a few entries down ! Response from the owner Thank you so much for expressing your appreciation for the thought and time which has gone into beach view - we are delighted it exceeded your high expectations and that it met the approval of all generations! We look forward to you returning. You can get in touch with Hilton (the owner) through the contact form on this page. Send Hilton (the owner) an email through the contact form on this page. Alternatively, if there’s a phone number on this page, you can call them. How do I contact Hilton (the owner)? You'll need to send Hilton (the owner) an enquiry to book - the owner will let you know how to pay. If they accept online booking they'll send you a quote and info on how to pay. If you pay through our website you’ll be covered by Payment Protection. Or you can send Hilton (the owner) an enquiry through the contact form to request a quote. Hilton (the owner) will email you the total cost for your dates and how to pay. Send Hilton (the owner) an enquiry through the contact form requesting a quote for your holiday dates. Hilton (the owner) will email you the total cost for your dates and how to pay. Hilton (the owner) of this property is responsible for taking and refunding your damage deposit. The damage deposit terms should be agreed before booking and outlined in the booking contract, if Hilton (the owner) supplies one. Please refer to these details or contact Hilton (the owner) directly if you have any questions. You'll need to contact Hilton (the owner) to cancel. They should have provided their contact details when you made your booking - otherwise, email them through the contact form. You'll need to contact Hilton (the owner) to edit your booking. They should have provided their contact details when you made your booking - otherwise, email them through the contact form.